Some of us have the gift, luckily or unfortunately, to be often on the border between this plane of reality and others. 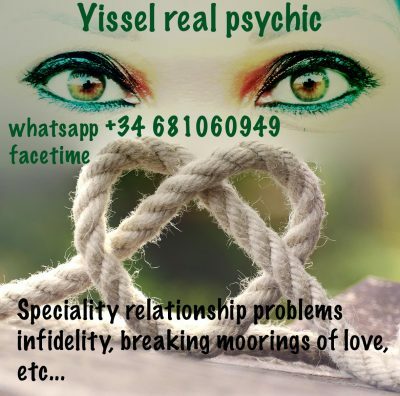 I am born true psychic, and I have learnt several magical techniques over the years such as reading cards or tarot, and rituals of white magic among others, to be able to give RELIABLE PREDICTIONS AND EFFECTIVE SOLUTIONS. I can help you with any type of problem, without forgetting something very important that is the honesty. Psychics has a greater power of concentration and mental to perform rituals and spells, taking certain materials that Mother Nature provides us, whose energetic qualities are vital in this process. Magic and esotericism have always existed and the elites have used them for their own benefit in all civilizations throughout history, hiding this knowledge from the common people. Hence the name of occult sciences. The whole universe is energy, the universe is mind and therefore our thoughts are also energy, which can materialize and create reality. Time is not linear as we appreciate it, but past, present and future coexist although we do not appreciate it consciously except some people with that quality.